Modeling marine particles and studying their global effects on climate change is the focus of Harris’s senior research. Working with Professor Ephraim Woods, Harris artificially creates particles that represent what would come off of ocean spray. “By doing that in a controlled environment, we’re able to treat them to other chemicals or molecules and put them in certain environments we think are being caused by humans,” Harris says. He was Most Valuable Player of the 2018 Patriot League Tournament, which the Raiders won for the third year in a row and are the only team in the league to ever do so. Harris had two assists and two goals in this year’s tournament. Averaging 8 to 10 miles a game, the midfielder estimates that he ran 250 miles this season. “As a math and chemistry nerd, I like numbers,” Harris says. Tallying miles is one reason he appreciates the harnesses they wear, but also, the devices help with game strategy, showing a heat index of players on the field. 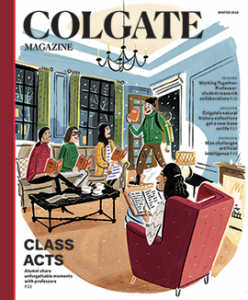 His Colgate legacy parents are Christopher ’87 and Louise (Richardson) Harris ’87. 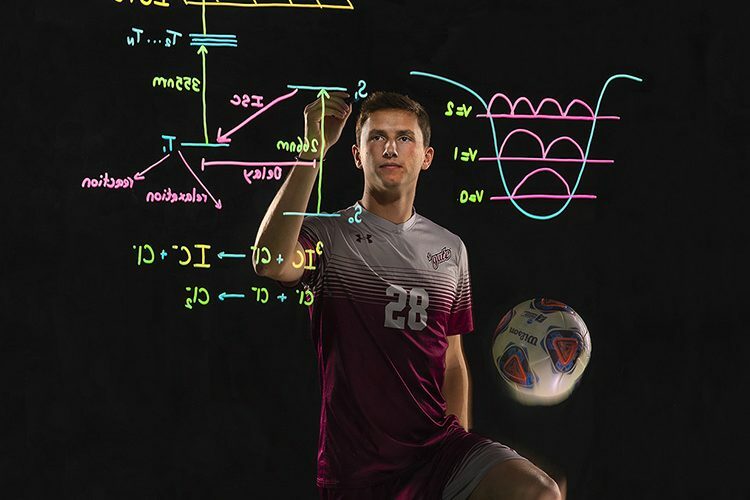 Christopher, having also been a Colgate soccer player, was naturally Oliver’s first coach from the time his son started playing at age 4. Louise was a member of the crew team, and as a biochemistry major, passed her science aptitude on to her son.